This site is dedicated to the life and work of Padre Pio. Pray Hope and Don't Worry. Please help the Padre Pio Foundation in this world of pain and hunger Please donate, all donations are tax deductible. Thank you. The “Road of Pilgrims” that runs to the Arcangelo Michele Grotto in San Giovanni Rotondo was created in the late 1800s. San Giovanni Rotondo is now famous all over the world as the native city of St. Pio (meaning Pius, and known in Italian as Padre Pio) of Pietrelcina, and as the city where the venerated monk worked his miracles. Pio was beatified in 2002, and it was he who founded the Sanctuary adjacent to the ancient Convent of Santa Maria delle Grazie. Next to the Convent a second, larger Sanctuary (designed by noted architect Renzo Piano) was inaugurated on July 1, 2004. Originally built in 1540, the Capuchin Monastery is the site where the Saint lived from September, 1916 until his death in September 1968. It was here that Pio received the stigmata in 1918, and where all those supernatural events that led to his sainthood and canonization took place as well. Visiting this Monastery and viewing the chambers where St. Pio conducted his life means jumping into a context of spirituality and mysticism; it is a destination that the devout and tourists alike should make every effort to visit. Next to the Monastery rises the Church of Santa Maria delle Grazie, originally dedicated to Santa Maria degli Angeli, consecrated in 1629. Inaugurated in 1959, thanks to the perseverance and passion of Pio, the old Sanctuary welcomed the thousands of faithful and pilgrims that arrived in droves everyday. They came to this small Apulian village to see the places where the Saint lived out his faith, up until the realization of the new Church. The Church’s crypt also hosted, up until a few years ago, the tomb of St. Pio, now found inside the crypt of the new adjacent complex. Long dedicated to Santa Maria delle Grazie, the new Sanctuary conceived by Renzo Piano occupies – with its enormous conch-shell structure – approximately 6,000 sq.m. (64, 584 sq. ft.) and represents the second-largest church in Italy after Milan's Duomo. 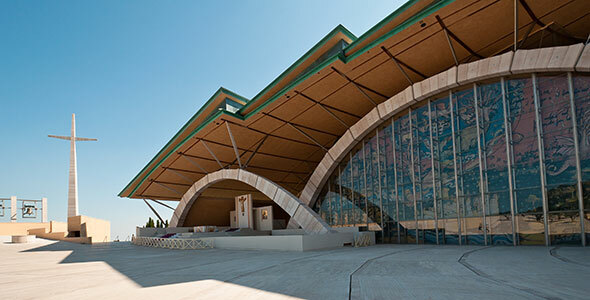 Finally opened after ten years of construction, and also known as the Church of St. Pio, the new Sanctuary was almost entirely financed by the offerings of pilgrims. Today it can hold up to 6,500 people at once. By the request of Pio, the Church, whose walls are composed of stone from Apricena, was to be used as a place of welcome for the faithful: the external churchyard, in fact, features details and characteristics that repeat on the church’s interior – corresponding floor designs were planned to emphasize harmony between the exterior and interior. This choice is also evident in the separation of the two environments by a stained-glass window decorated with scenes from the Apocalypse. On the Church’s subterranean level is located a lower church (similarly to the Basilica of St. Francis of Assisi) where the remains of the Saint reside. The roof, of oxidized copper, confers to the structure its characteristic green color. This profound mixture of historic, religious and architectonic elements render the Sanctuaries of Padre Pio an indubitable point of interest for all, including those who are not particularly devout, or who may not profess any faith at all. Saint Padre Pio, pray for us! Padre Pio and the Padre Pio Foundation all Rights Reserved.